Platinum Heating and Air 500 has provided total home comfort to Peninsula homeowners for 75 years. We specialize in Carrier HVAC repair, maintenance, and replacement of existing heating and air conditioning systems. Our friendly and well-trained service and repair technicians will come to your home and install your high quality Carrier system for you. We want to provide the best for our customers. 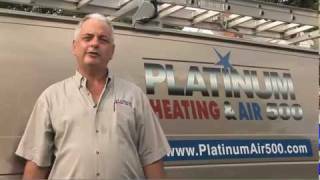 Platinum Heating and Air 500 is the only company you will ever need for your home comfort. Whether you are considering repair, replacement or maintenance of your existing air conditioning, heating, furnace or heat pump system, Platinum Heating & Air 500 will get the job done right the first time. We repair major brands such as Goodman, Carrier, Trane and York. We guarantee that all repairs will be done right, or the repair is free. We have found Carrier to be the highest quality HVAC systems on the market for both price and quality. Contact Us for a new HVAC system. When you are a Preferred Client, you can expect our highly trained, competent technicians to become familiar with your HVAC system. Change your system’s filter every three months. A dirty filter will make the system work harder to keep you warm or cool — wasting energy. We repair and service all makes and models to include Carrier, Trane, Ruud, Rheem, York, and Janitrol. We are available 24 hours a day, 365 days a year. We carry a large stock of parts for older units. Over our 75 year history, Peninsula Electric Heating and Air / Platinum Heating and Air 500 have been a new equipment dealer for Carrier, Trane, York, Whirlpool, Tempstar, and Coleman. We offer Platinum Service at reasonable prices. Clean cut, uniformed technicians always respect you and your home. We wear shoe covers (we call them floor savers) and never do a repair without giving you a straight-forward price first. Give us a try. It’s money back guaranteed and I guarantee you will be pleased with Platinum Heating and Air 500. Copyright 2019 © Platinum Heating & Air 500. All Rights Reserved.